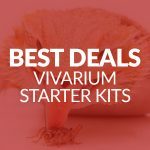 Home » Blog » Vivarium vs Terrarium – What’s the Difference? If you’re new to the world of reptiles, you’ll no doubt be getting to grips with all kinds of new terminology. There’s a fair bit to get your head around and one of the most frequently asked questions is this – what’s the difference between a terrarium and a vivarium? The two words seem to be used interchangeably, and it can be a real puzzle trying to figure out what the difference is. And if there is a difference, whether it even matters! Luckily for you, we’re here to clear things up! To explain what a terrarium is, we need to back up a bit. Back before specially made reptile tanks were widely available, people used to use empty aquariums to house reptiles. This led to the term “terrarium” because the empty aquariums were used to house terrestrial animals (rather than water-dwelling creatures). Nowadays, terrariums tend to be used to house creatures that need access to both land and water (frogs, newts, crabs, etc). In essence, it’s a hybrid type of tank and tends to be the ones that are made out of plastic or glass (because they’re waterproof). A vivarium can be anything you use to make a home for your pet. It comes from the Latin “vivere” which means “to live” so technically even a rabbit hutch or a dog kennel could qualify as a vivarium (although you’d never call them that). So a vivarium is the umbrella term for any type of reptile tank – glass, plastic and wood. Basically anything your reptile can live in is a vivarium – even a terrarium is a vivarium. 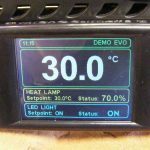 Plastic vs. Glass Vivariums – Which is Better? Glass vs. Wooden Vivariums – Which is Better?